Pet Gear Travel Lite Soft-Sided Pet Pen with Removable Top Sage 36" x 36" x 23"
Item Title: Pet Gear Travel Lite Soft-Sided Pet Pen with Removable Top Sage 36" x 36" x 23"
The octagon pet pen is a wonderful place for your small dog or cat. It is vented on all sides and the top can be left open or closed. The front door allows for easy access when opened. It is a great travel pen and easy to set up and take down for quick access. Folds completely flat for easy storage and portability. Front-zip door can be left open for easy access or closed for containment. Removable top is partly vented and provides shade from the hot sun. 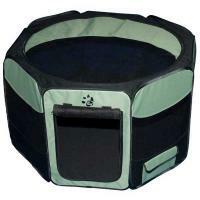 Side storage pockets provide a place to keep things you might need to care for your pet handy. Made of 600 denier nylon. Size: 36" x 36" x 23"
"Called and checked on order and the woman I talked to was very nice and helpful."